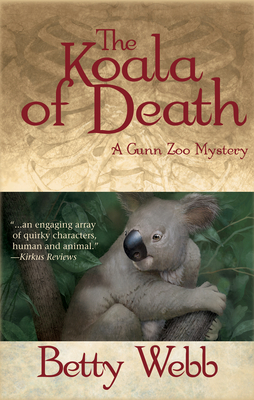 When zookeeper Theodora "Teddy" Bentley fishes the body of Koala Kate out of Gunn Landing Harbor, she discovers that her fellow zookeeper didn't drown; she was strangled. The clues to Kate's killer implicate other animal keepers at Gunn Zoo, including Outback Bill, marsupial keeper and Kate's Aussie ex-boyfriend; and Robin Chase, the big cat keeper who's got it in for Teddy. Also displaying suspicious behavior are several "liveaboarders" at the harbor; Speaks-To-Souls, a shady "animal psychic;" and even Caro, Teddy's much-married, ex-beauty queen mother. Before writing mysteries full time, Betty Webb worked as a journalist, interviewing everyone from U.S. presidents and Nobel Prize winners, to the homeless and polygamy runaways. Most of her books are based on the stories she covered as a reporter. Today she's a volunteer at the Phoenix Zoo, and is also a member of the National Federation of Press Women, Mystery Writers of America, the Society of Southwestern Authors, and Women Writing the West.